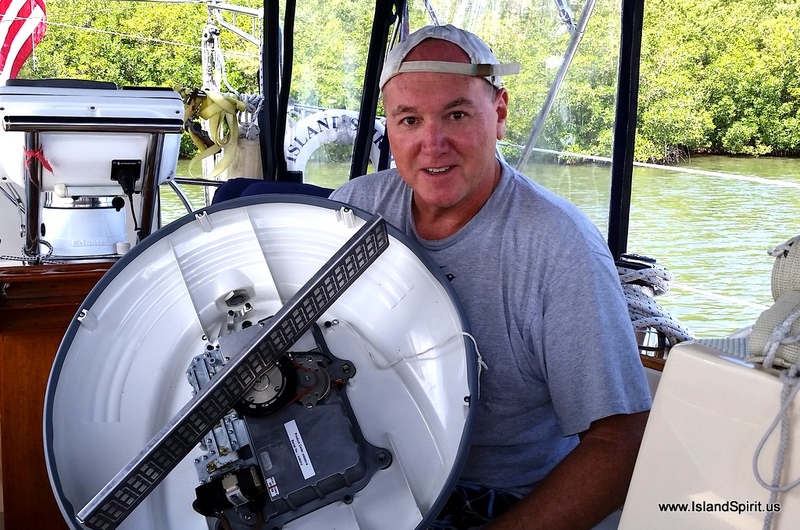 This has been a full week of repair work on Island Spirit as we repaired and installed a new alternator, fixed the windlass by installing new brushes on the motor, and removed our radar antenna and installed another one given to us by very good friends. As of yesterday, Monday, May 18, 2015, we have all systems fixed and running and we feel much better about heading north offshore for Rock Hall, Maryland. We always try to do all our own repair work and our own installs. That way, we know the systems very well and when they break down or do not work, then we have a good idea of how to take them apart and possibly fix them. 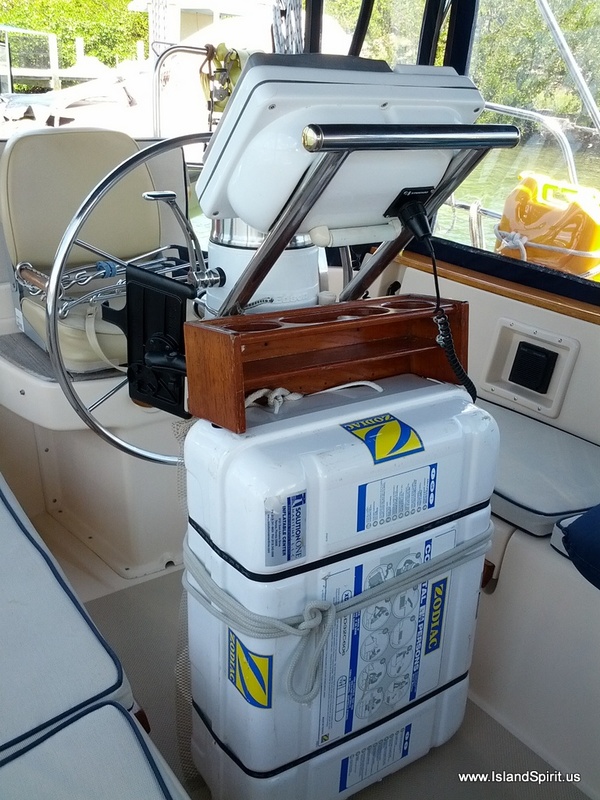 On this boat, we have modified nearly every system, either by installing a new one or fixing an existing installation. 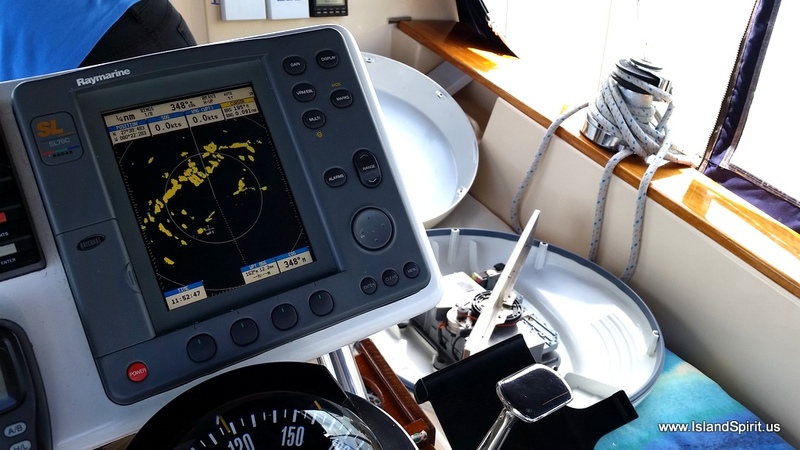 It is great to know the boat and all systems as well as we do. We think this knowledge is an asset and that is why we do it. 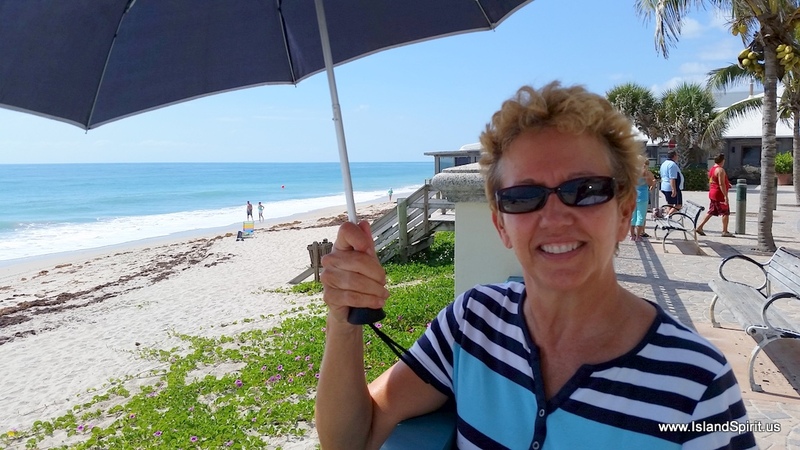 During this week in Vero Beach, Florida, we had another good IP friend loan us her car. WHAT? Yes, a car to use while we are here. We rode the bus to the shopping mall and then walked the last 3 miles to pick up the car from storage. This has really been a fantastic help as we have been running around, getting parts and repair items to fix our systems. 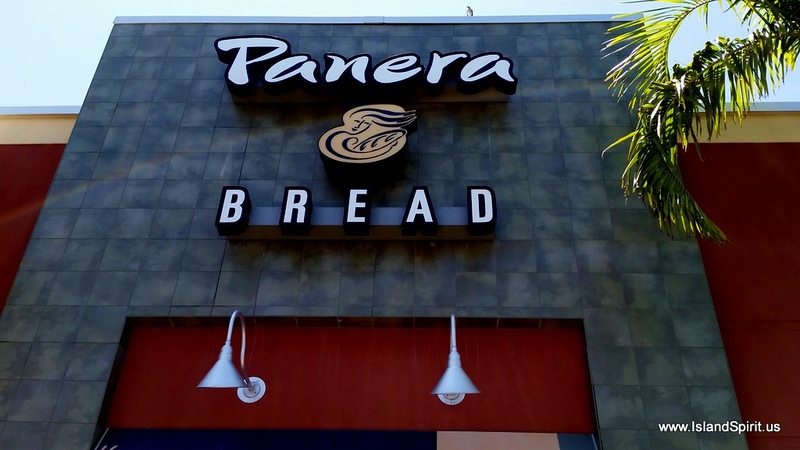 Yes, we also have used the car to go to Panera Bread, our favorite lunch stop, with their half salads and half sandwiches, WOW, what a treat! Thank you, Sharon, for the use of your beautiful car. It is a BMW so I named it Britney My (other) Woman for B.M.W.! She is beautiful with my favorite color scheme, blue with tan leather, (perfect!) and a 6 speed stick to enjoy as well. Fun, Fun, Fun! 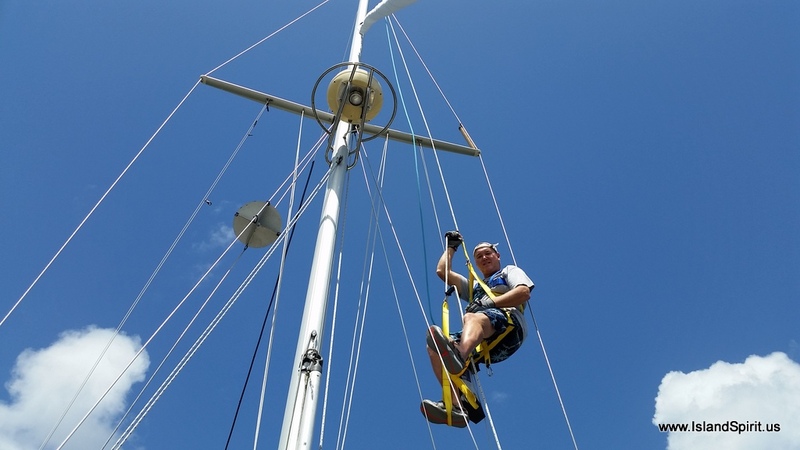 After fixing the windlass by installing the new brushes, my next challenge was to climb up the mast for the 4th time and bring down the broken radar antenna. Then, I lifted up and installed the antenna my buddies gave us. WHAT? 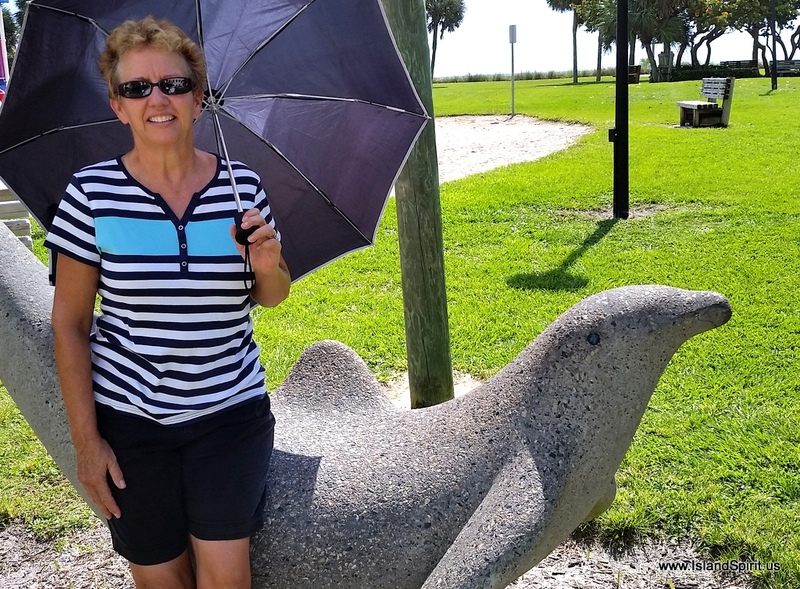 Yes, our other IP friends in Fort Pierce, Sam and Carolyn, had an old analog radar antenna that they removed when their display head unit failed. They then installed a new digital radar, so they had an old antenna. Sam and Carolyn gave us this antenna to get us home to Rock Hall. We lifted it up to the mount and installed it and wired it into the existing network and, sure enough, it worked! We now have a working radar system and we really appreciate this gift from them. Thank you so much! Hoist the flags, the office is open! 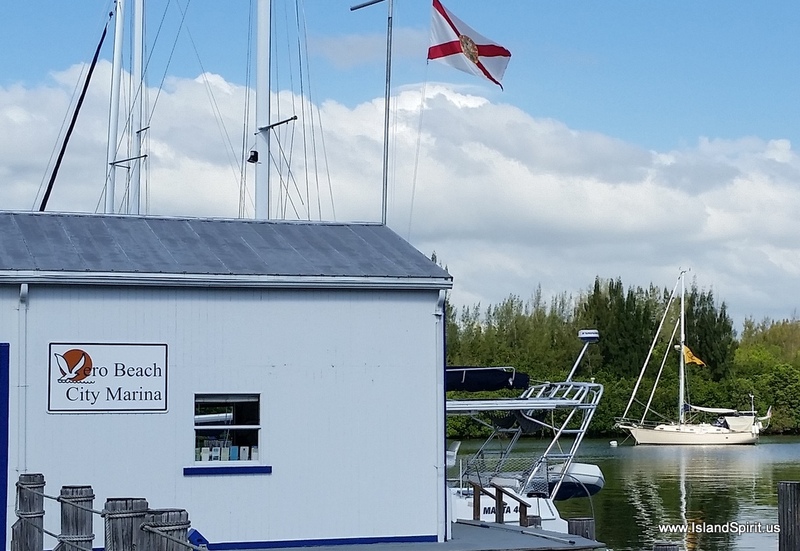 Once all the repairs were finished, we hoisted our Island Packet Yachts flag and our Whiteaker Yacht Sales flag and the “office” was open for business! 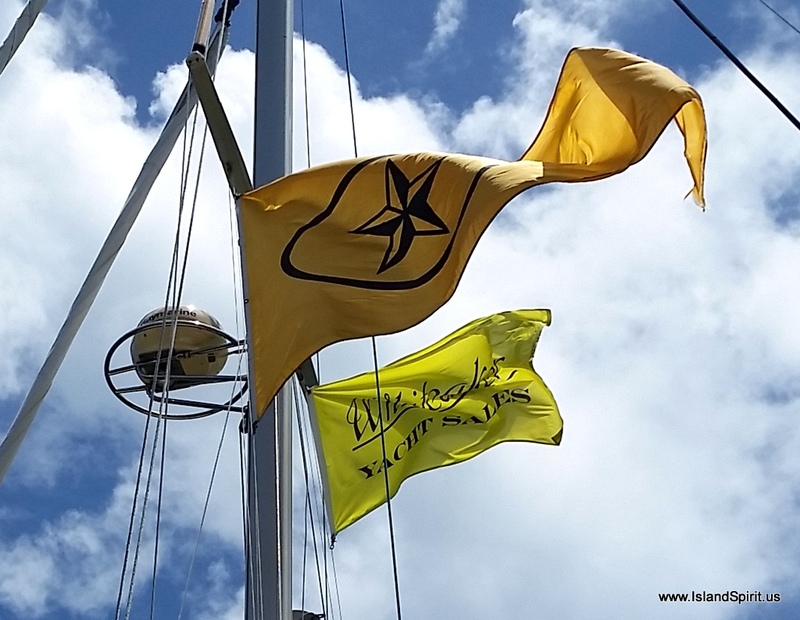 We have a great spot in the harbor and, as you all know, we love flying these flags. You can’t miss us. So now with the convenience of a car and the great shopping at Vero Beach, we are restocking a few depleted items and also replacing some well worn out clothing. When you live on a boat as we have been for the past 9 months, your clothing becomes well worn and you get tired of the same old outfits. So, it is off to the outlets for some new clothes. 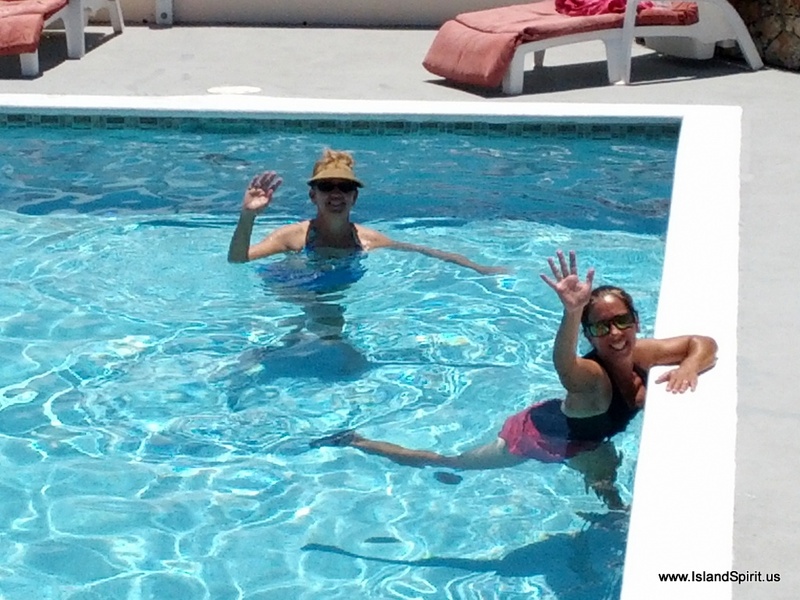 Here are some photos of the days…. 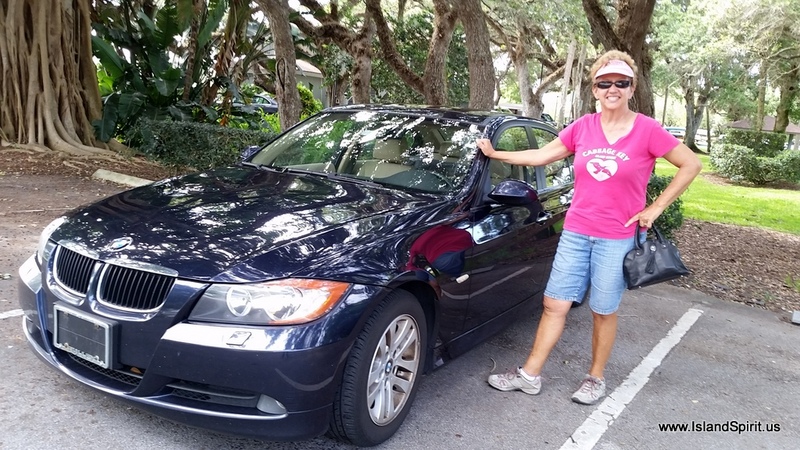 A BMW loaned to us by Sharon, thank you! Thank you, Sam and Carolyn! 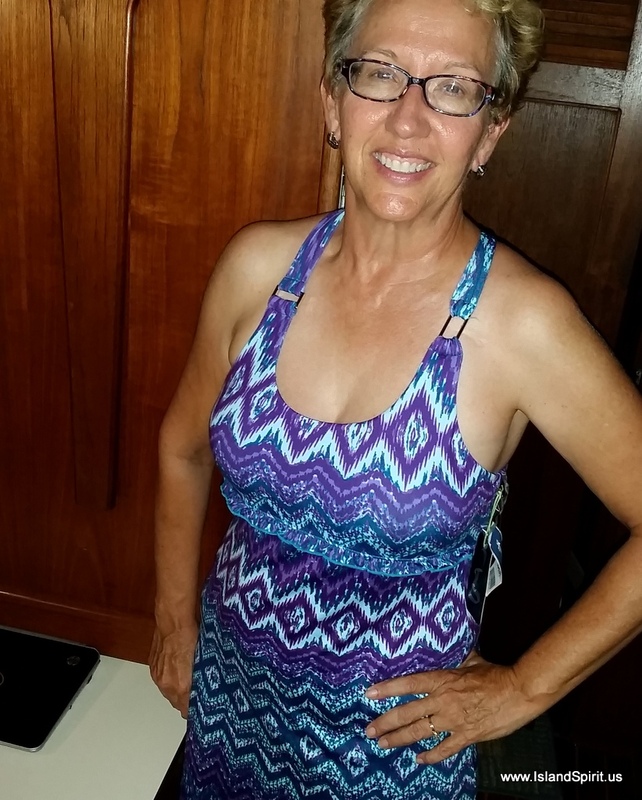 Radeen modeling a new sundress. 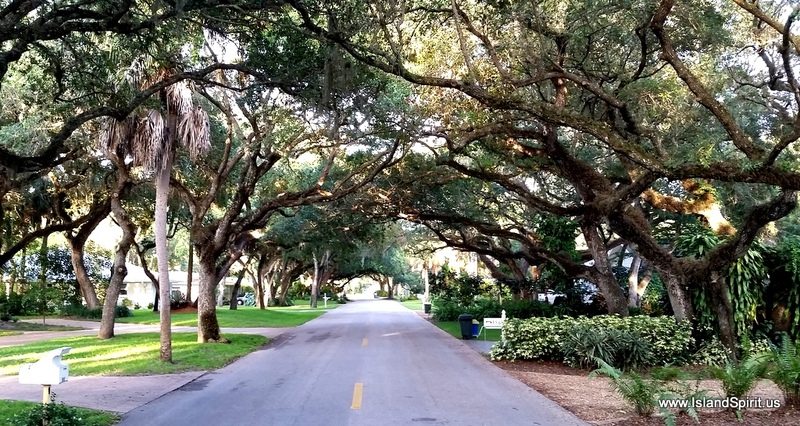 Living in Vero Beach, with a car, is sure E A S Y and F U N. Driving a BMW is a really special treat! With all systems running and repaired, life is good. Now we can focus on our next adventure and prepare for that. 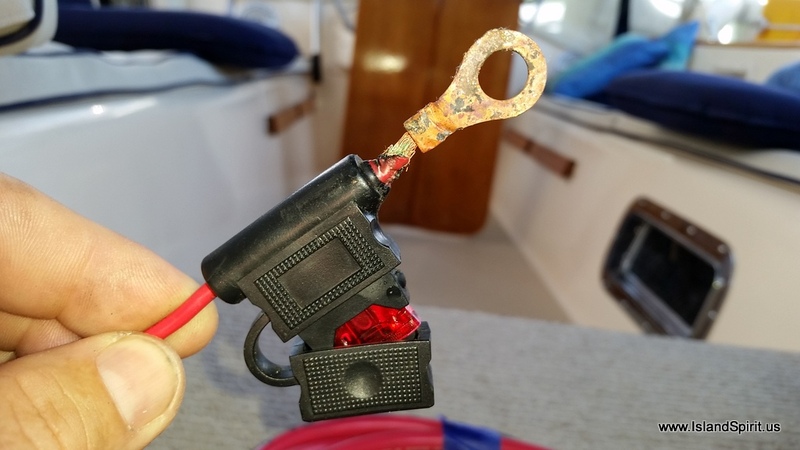 There is nothing as frightening as an electrical fire onboard a boat at sea while underway! Nothing. 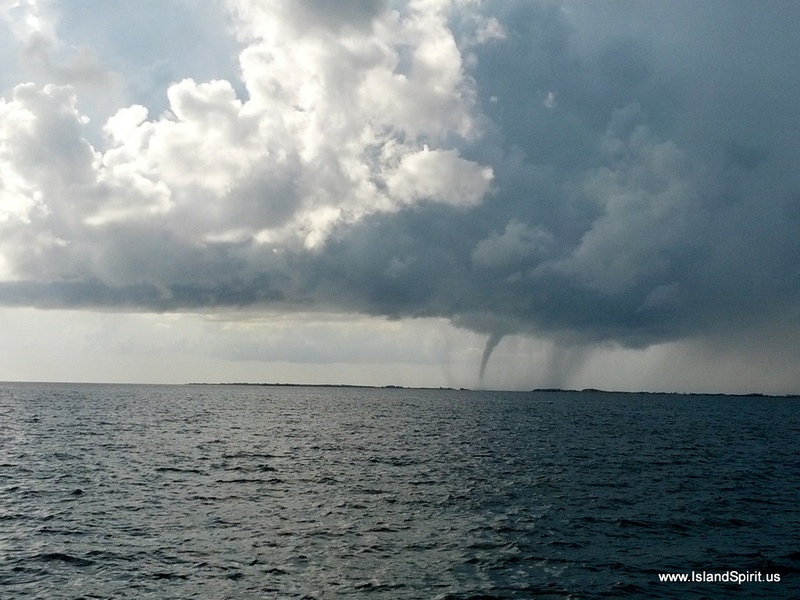 This happened to us as we were heading to the Bahama Banks from Crab Cay via Grand Cay. 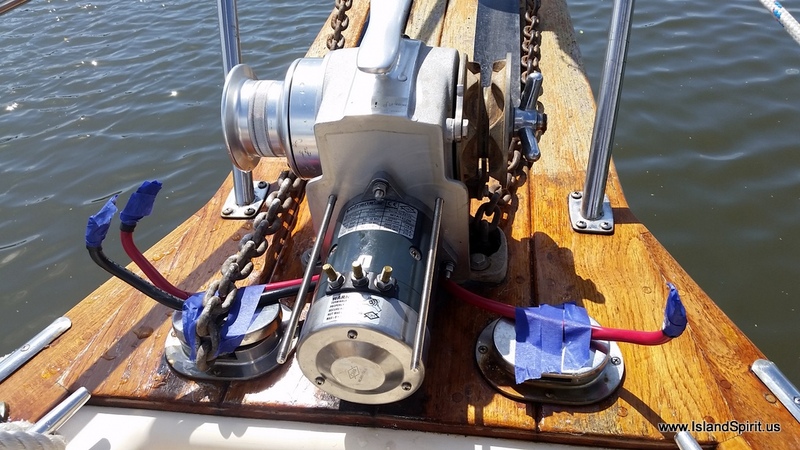 Luckily, we have a procedure taught to us by Tom Tursi of The Maryland School of Sailing and Seamanship. We check our engine room and bilges upon first starting and then check them every hour, yes, every hour, while we are running. This procedure just saved us from a full out electrical fire onboard. When doing our first engine room check underway, by looking into the engine space, we saw sparks arcing from the back of the alternator! WHAT? SPARKS? OH NO. SHUT DOWN THE ENGINE NOW! This stopped the outflow of the amps being produced by the 120 amp alternator, but it did not stop the sparks and amps flowing FROM the 600 amp hour battery bank. The positive post on the alternator was failing and it was shorting to the alternator case. 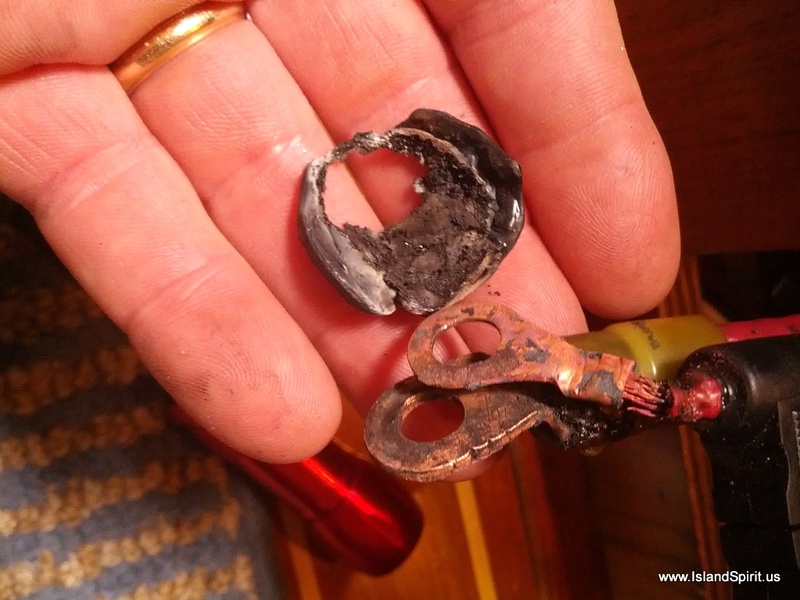 This arcing and sparking was generating enough heat to melt the wiring harness and the wires attached to the alternator at the positive post. 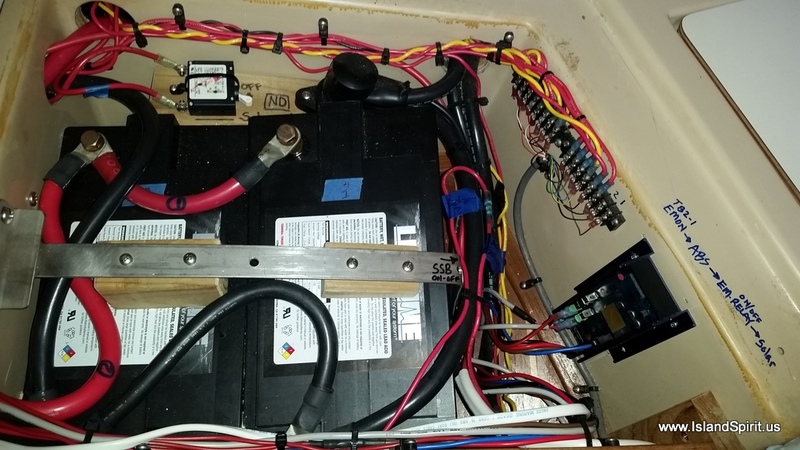 To stop the electrical current flow, I had to drop the battery 1-2-All switch panel and then disconnect the positive wire connected to the alternator. 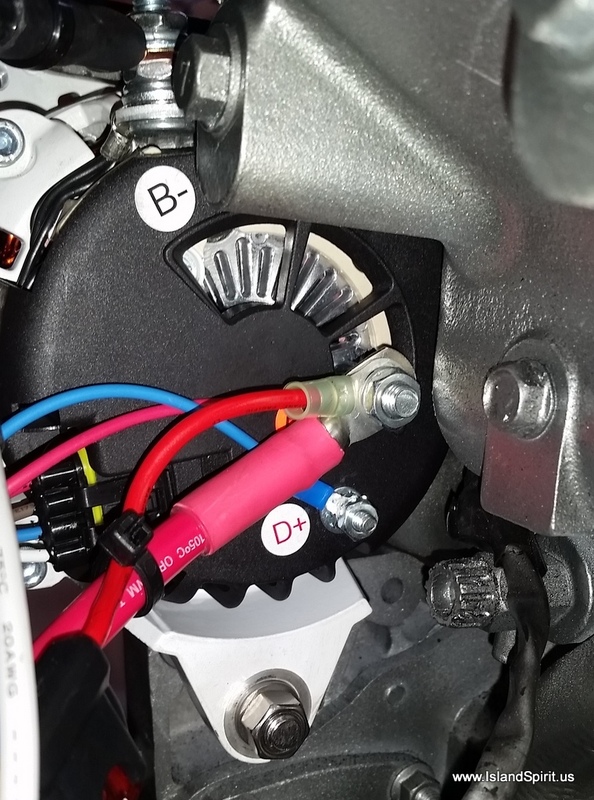 Once this was disconnected, the alternator circuit was now open and the current and shorting stopped! WHEW, SAFE at last, NO FIRE. Close to a fire, but Tom Tursi engine room checks saved our boat once again! Now at this point, Sunday morning, we have no more alternator so we continued on with Wind and Solar for our electrical needs. Little did we know, it would be 5+ days without an alternator until we resolved this problem. We sailed on and reached the Bahama Banks where we anchored all by ourselves in the middle of no where. 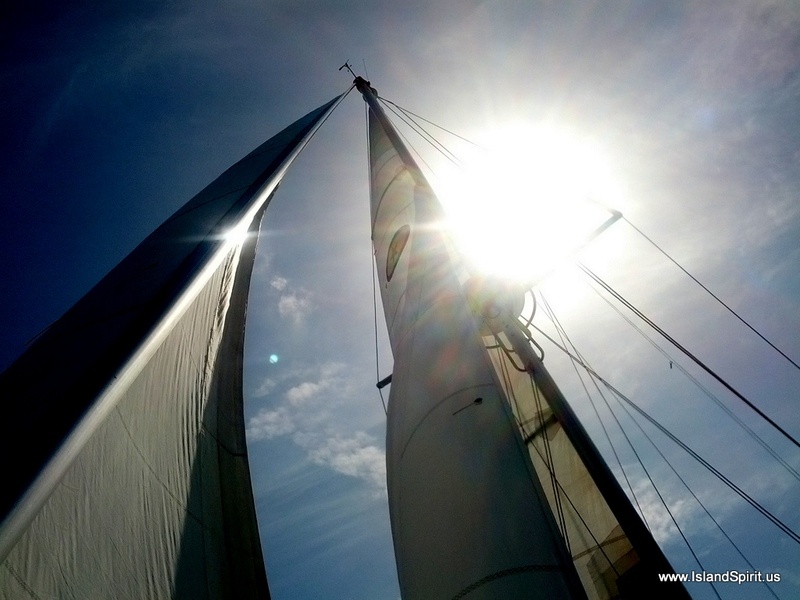 The night was to be relatively calm with 10 knots of winds, but as usual, the winds came up to 20 knots and we spent our worst night on a boat we have ever had in 25 years! Cabinet doors were flying open, the boat was rolling side to side, deck to deck, and the bow was going up and down so much the anchor pulpit would hit the water. The anchor bridle was tugging at the bridle so hard, I thought it might break or rip the deck cleats out. 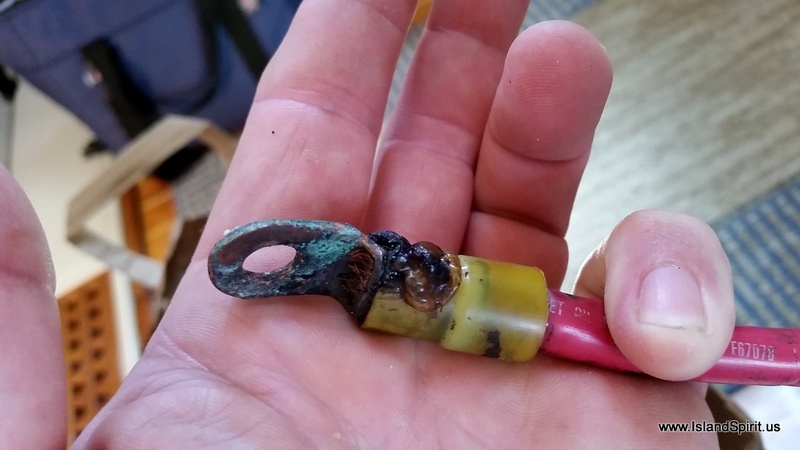 We had 150 feet of chain out and our 55 lb ROCNA anchor and our windlass is broken. So, there was no way we could recover the anchor in these conditions by hand at night. It was too dangerous. We talked about it but decided we would need to wait until daybreak. 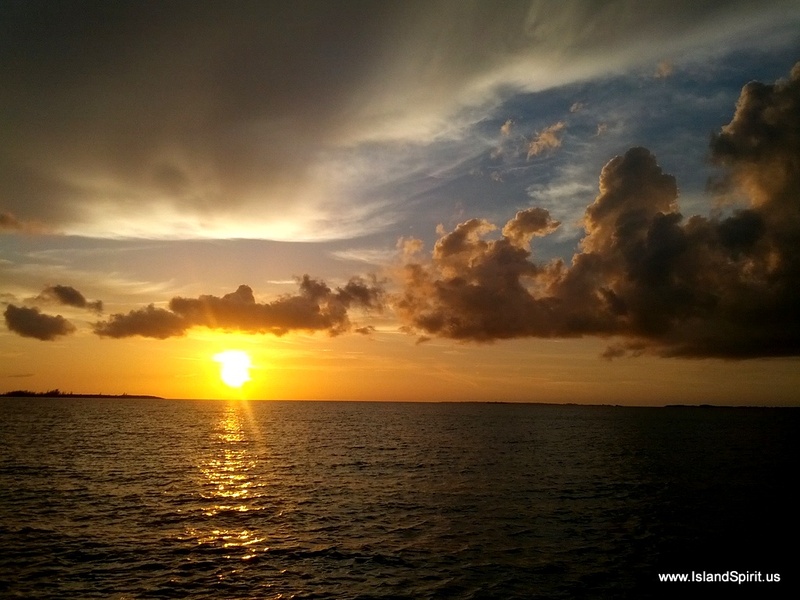 The sun finally came up and we hauled the anchor in by hand and set sail for Fort Pierce, 62 nm miles away. 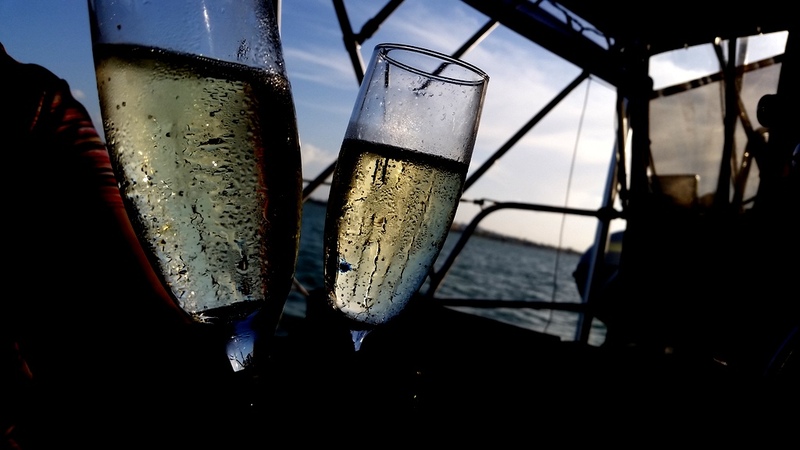 We arrived Fort Pierce by 1700 and headed directly to the anchorage where we popped a bottle of bubbly (it was Cava sailed from Spain by good friends, Ed and Sue) and celebrated our successful trip. That night, we crashed at 2000 and did not wake until 0700! Now, it was time to replace this alternator. 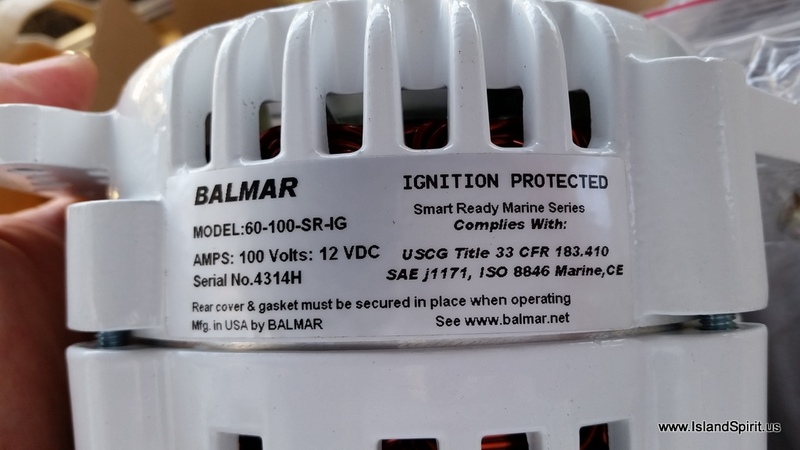 We ordered a new Balmar, available the next day, and we walked the 1.5 miles to West Marine to pick it up. While there, I made all new wires and and a new wiring harness. Of course, during this three day on-anchor repair job, it took us three trips to West Marine and one UBER car ($28 round trip) to NAPA for parts to complete the installation. The job seemed to take a lot more effort than expected because the new alternator has the positive post on the wrong side of the alternator. Guess what? 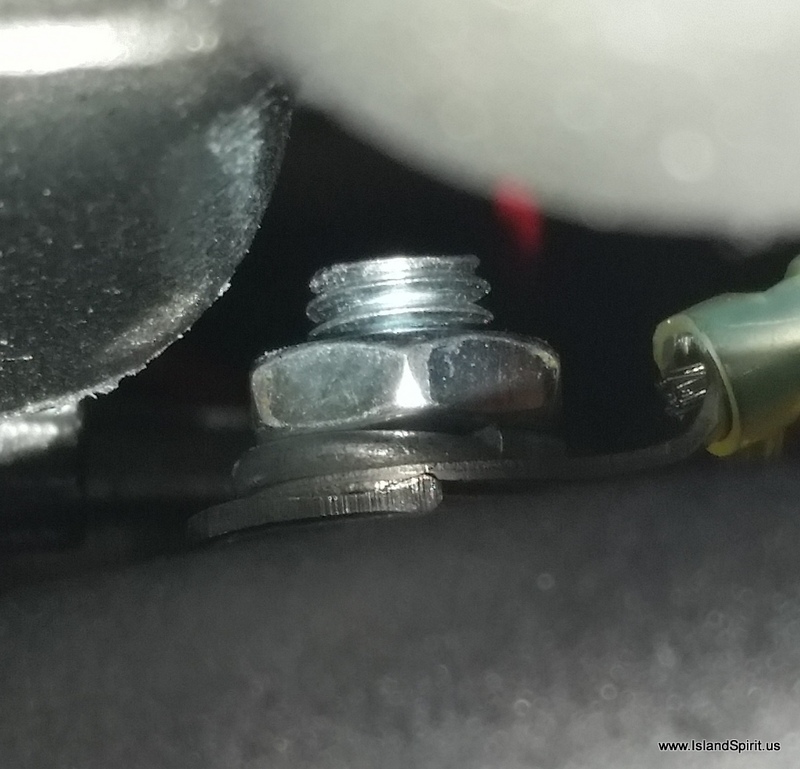 When first installed, this positive post grounded out against the engine block, so it would have had a shorting problem as well. I needed to solve this! 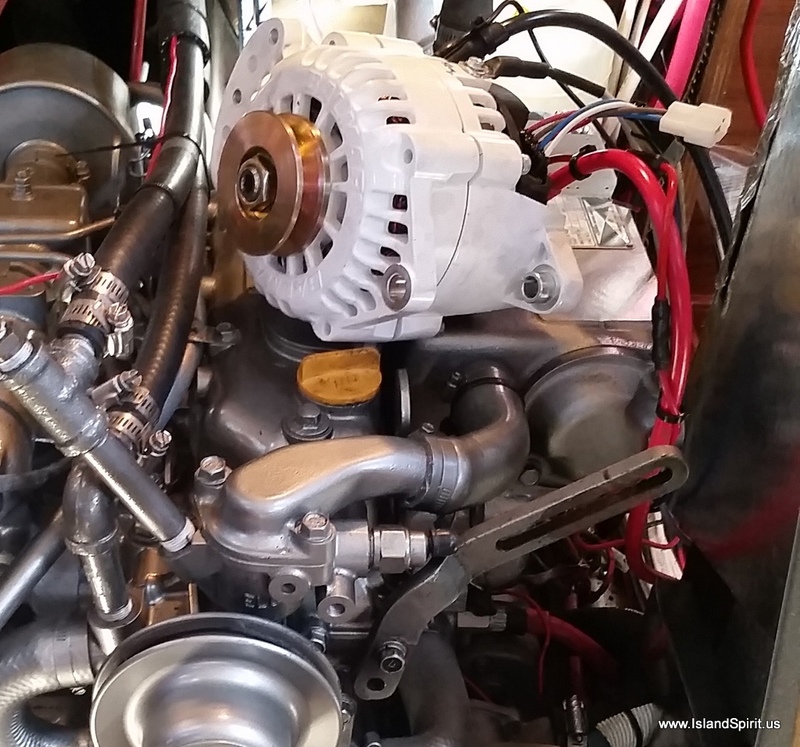 After several calls to Balmar, we removed engine room insulation to give the alternator more pivot room and then we went to NAPA for three belts, one 1/2″ longer, one 1″ longer and one 1 1/2″ longer. 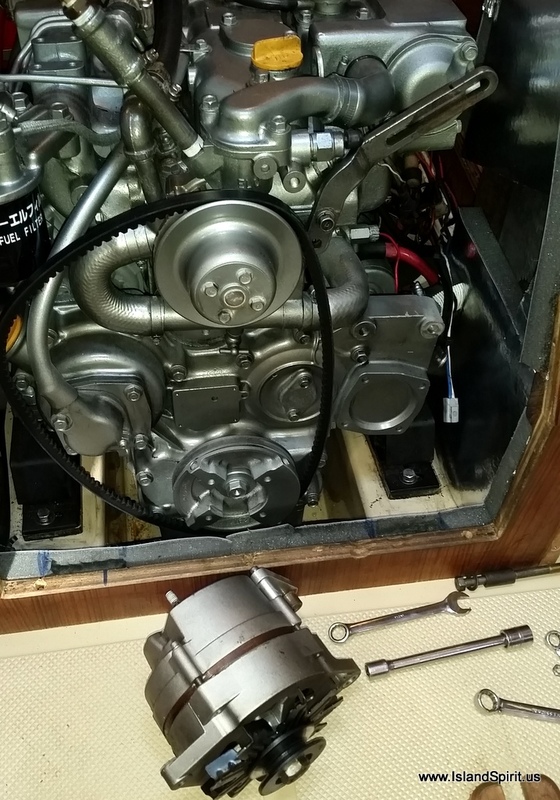 The longer alternator belt allowed us to pivot the alternator more outboard, getting the positive post away from the engine block. The one inch belt would have been best, but it put the alternator case against the engine room box, so we had to use the extra 1/2″ belt. 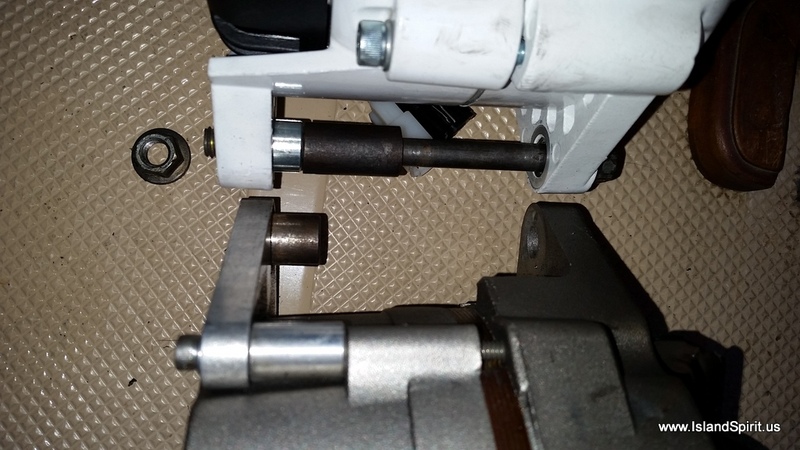 This only gives about 3/8″ clearance of the positive post off the engine block. If these two touch, we will have a short and the same problem all over again! Very frustrating situation. I need to add a rubber boot over this positive post for protection from this potential problem. Balmar needs to move this positive post to centerline or outboard. 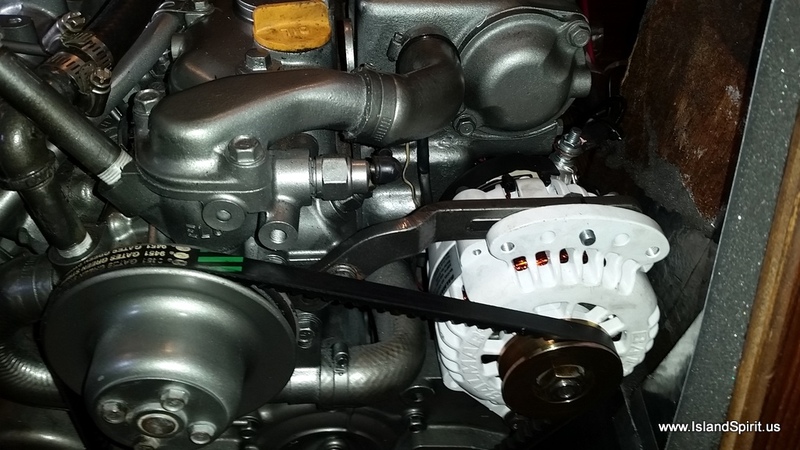 Here is a photo of the new alternator with the post nearly touching the block as installed now. 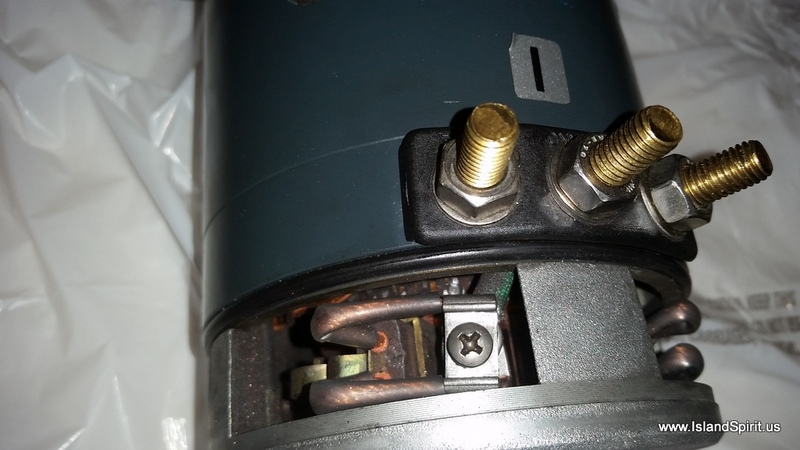 When inspecting the old alternator, I originally thought the short happened due to the insulator breaking down under the positive wire connection. Later I discovered the break down was inside the alternator case and the positive post was shorting out against the case at the connection. 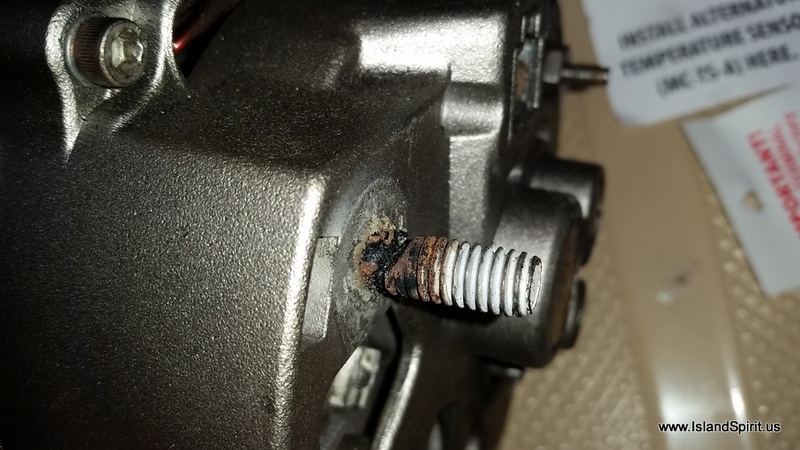 Here you can see the old alternator positive post and all the erosion from the arcing. Overall, we are very lucky we caught this early, before we had a full out electrical fire. Thank you, Tom Tursi and the Maryland School for teaching us safety procedures at sea. Here are a few more photos…..
Easy connections, but #1, the positive post, becomes a new problem! This post is inboard and touches the engine block! The mounting feet are different widths. I needed new bolts and new spacers. 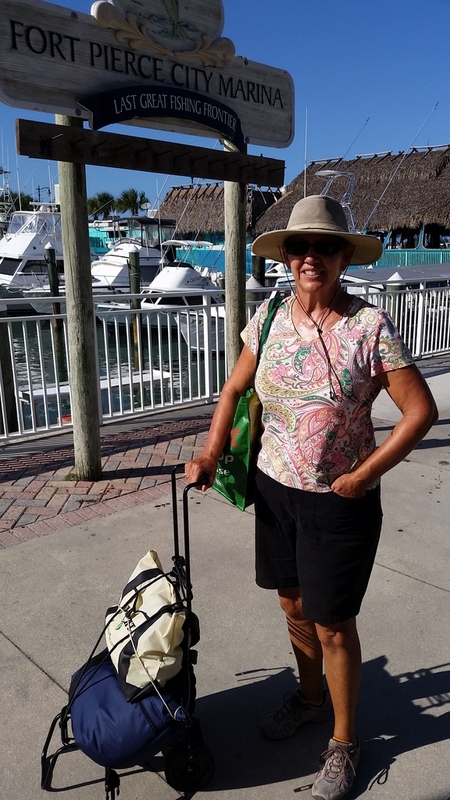 Another dinghy trip to shore and another walk. 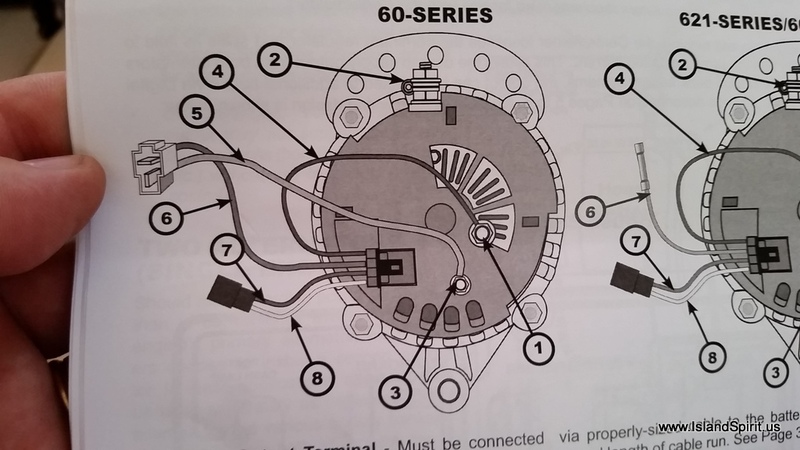 Working out the new wiring and connecting the new alternator. Installed….but we have a new problem. The positive post hits the block! 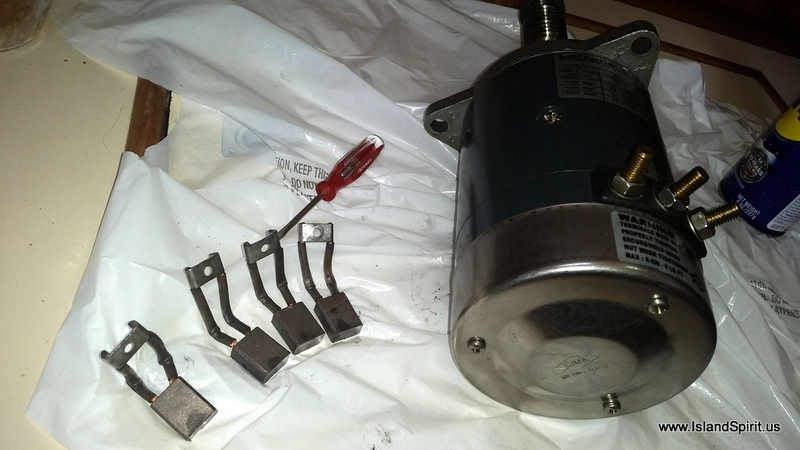 So, we bought a 1/2′ longer alternator belt and pivoted the alternator outboard. This is the positive post and how close it is to the engine block! New wiring to the Balmar regulator in the battery box. 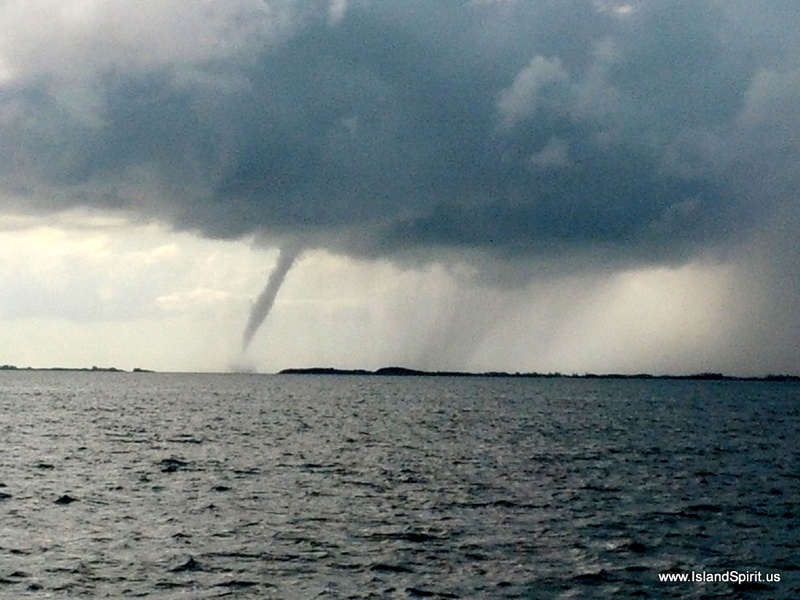 This waterspout was an indication of the troubles to come! In conclusion, DO HOURLY ENGINE ROOM CHECKS and simply know your engine room. You will look in there 1,000 times and nothing will be wrong, but, when something is wrong, you will catch it early, before it becomes a big problem. This could have been a huge problem or even a disaster in only another hour or two! They say, CRUISING is FIXING your boat in remote locations! How true, and this is NOT the way I want to recall cruising…..THIS IS the way I think of CRUISING…..ahhhhhhh! 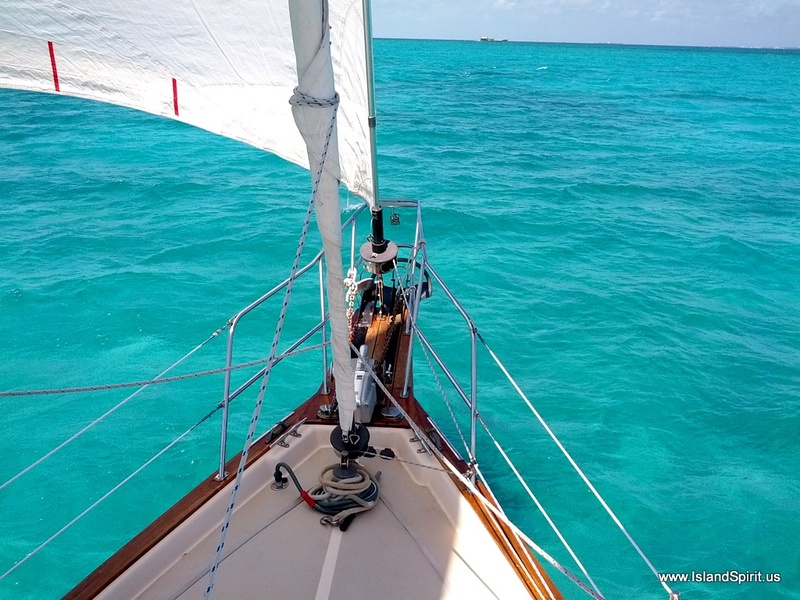 Team Island Spirit enjoying a sail in the Abacos in beautiful Blue Water. 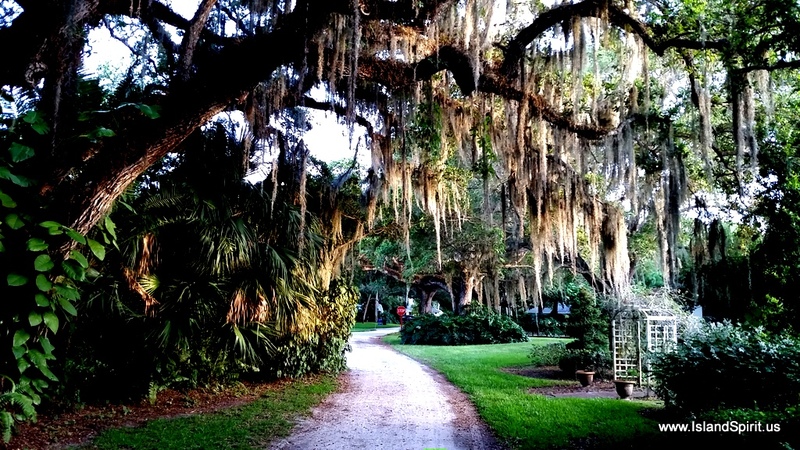 Beautiful and it is why we do this! With our radar system still not working after several tries to repair it, we have decided to NOT run overnight like we usually do. Instead, we will make day trips back to Florida. 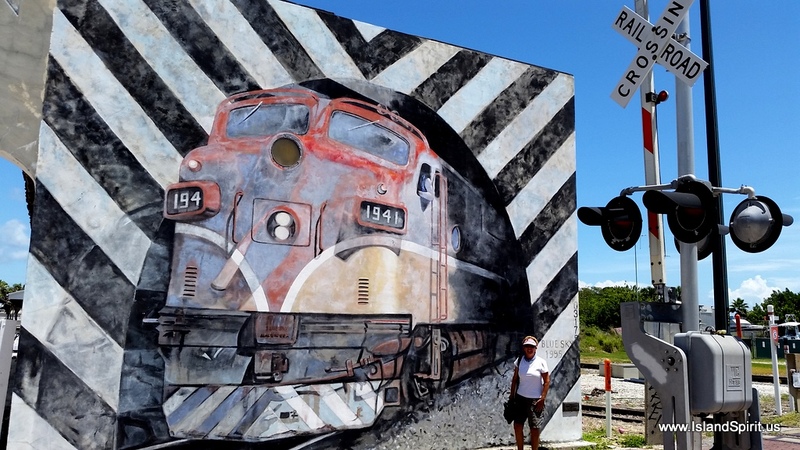 Running at night, without a radar system seems unsafe to us as we would be going full steam ahead in the black of night with no security of knowing there is nothing in front of us. We have a difference of opinion on this, but we have decided to day trip home. For us, this would need to be 3 to 4 days, so we have decided to see some islands we have not seen before and maybe skip Great Sale Cay. 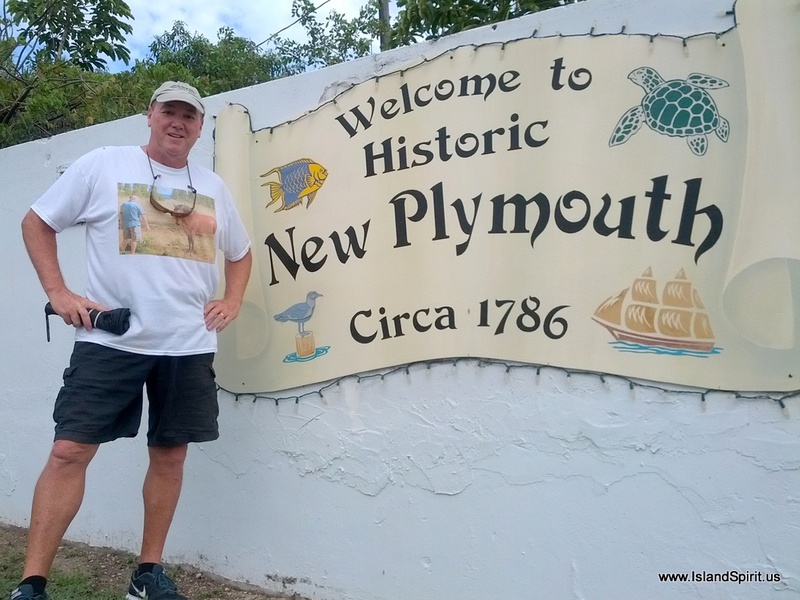 Our plan is as such: Day 1, Green Turtle to Fox Town, Well, we stopped short at Crab Cay off Little Abaco due to weather and unforecasted higher WEST winds. Day 2, Grand Cay because there is a small town there. 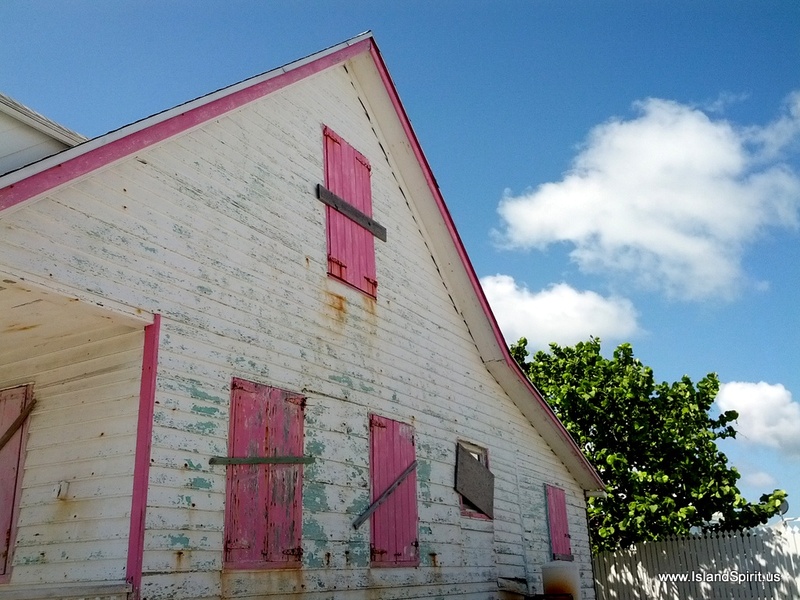 Grand Cay is northwest of Great Sale Cay. Day 3, Mantanilla Shoals at the end of the Banks where we will anchor and sleep in the middle of nowhere! We hope it will be calm seas. 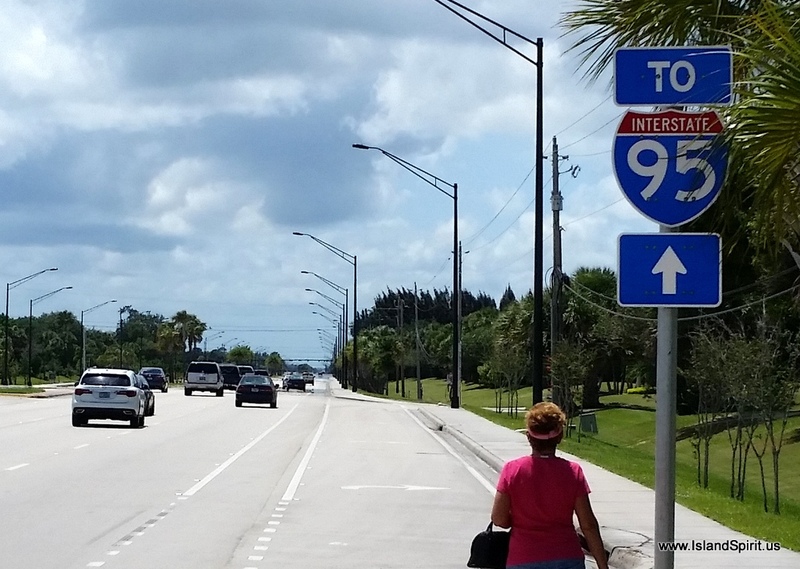 Day 4, Cross the Gulf Stream 62 miles, 9 hours, to Fort Pierce, Florida. Of course the weather is a bit stirred up due to the outflow of bands from the tropical storm ANA that is heading from here to Charleston, SC. This first storm of the 2015 hurricane season is early but it is also large and yesterday we had a thunderstorm that dropped a waterspout down to the water about 2 miles or more away from us. Too close for us. 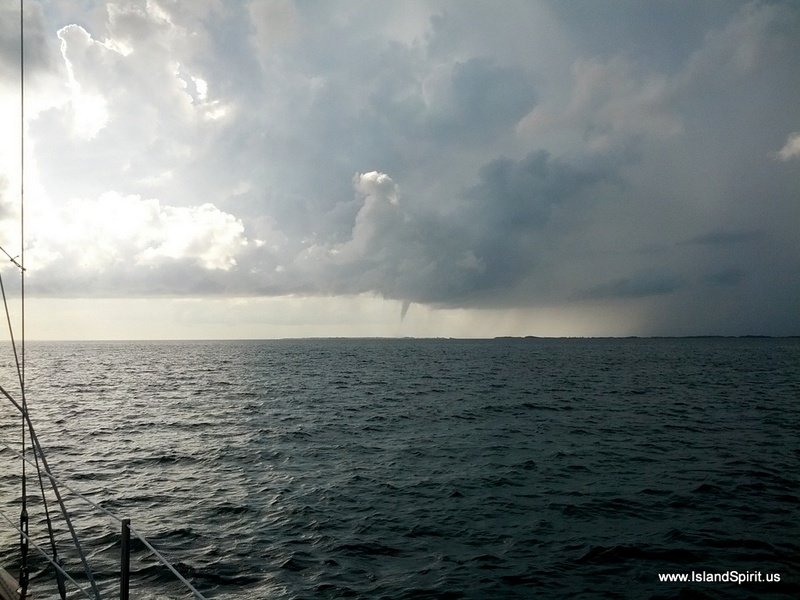 We could see the water flying up from the surface, a very scary sight to see when you are on anchor. 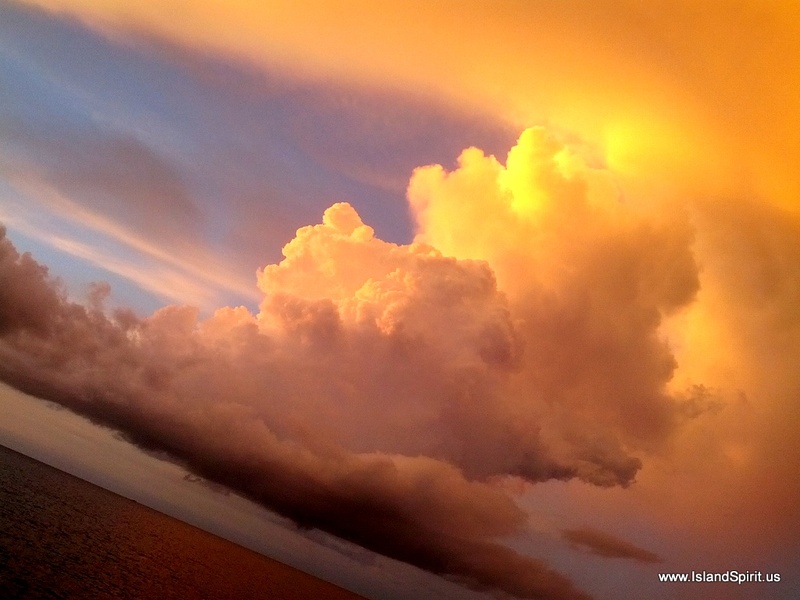 Lucky for us, it passed us by as we were securing the boat for the worst possible situation. Today some forecasts are calling for more of the same and we hope no storms develop. 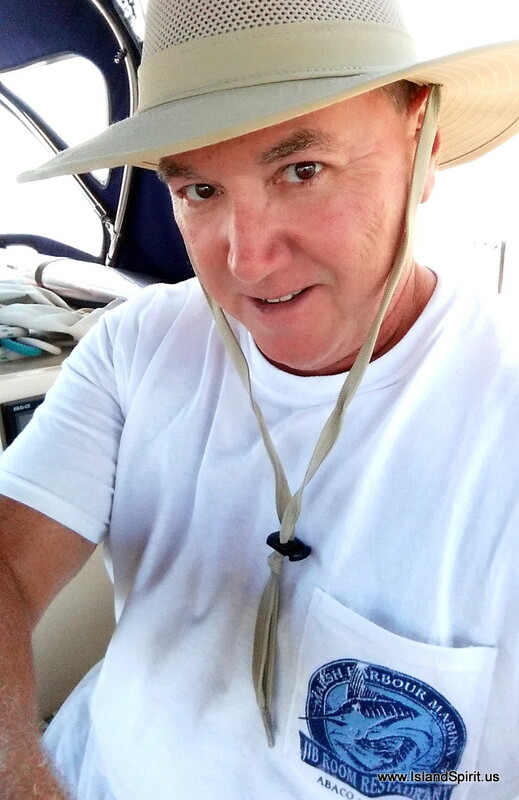 Before departing Leeward Yacht Club, after spending a week there waiting out this ANA storm to move north, we had fun with boat buddies and being at a dock. This was the first dock we have been at since leaving Marathon on Jan 15, 2015. 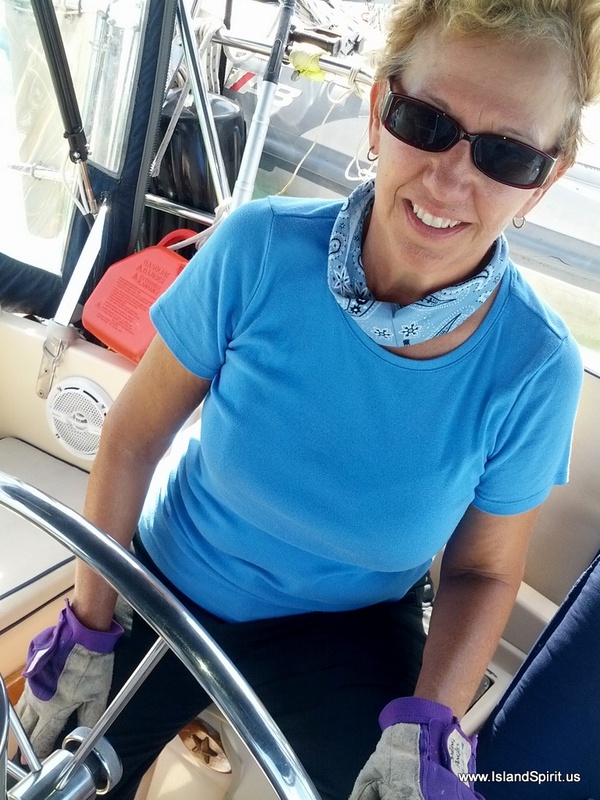 Jan, Feb, March, April on anchor, so being at a dock with water and power was a real joy. Boat buddies IP460 CUTTER LOOSE with Eric and Patricia and IP40 DREAM CATCHER with Greg and Sharon were docked along with us. Other boats included IP40 ZIPPITY DOO DAH, IP38 TATTOO II, IP40 TINTEAN and Spring Cove Marina friends, NEVERLAND, SYLESTIAL STAR. we all had good times catching up on our travels and our future plans. 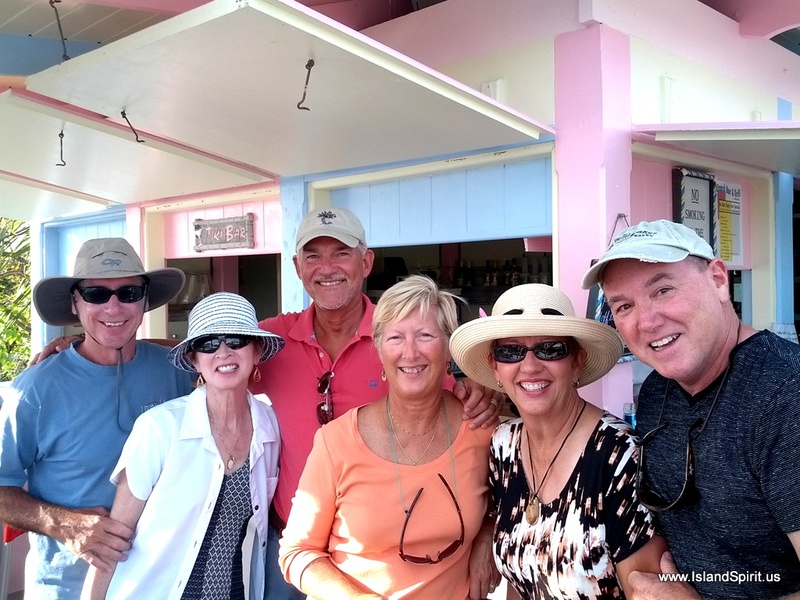 Cruising is so much fun and the people you share it with make the adventures all the more memorable! Heading to sea, the Life Raft comes out, Thank you Greg! Radeen with our buddy who directed us to LYC. Thank you, Sara! I am amazed at how well the 3G is working this year. 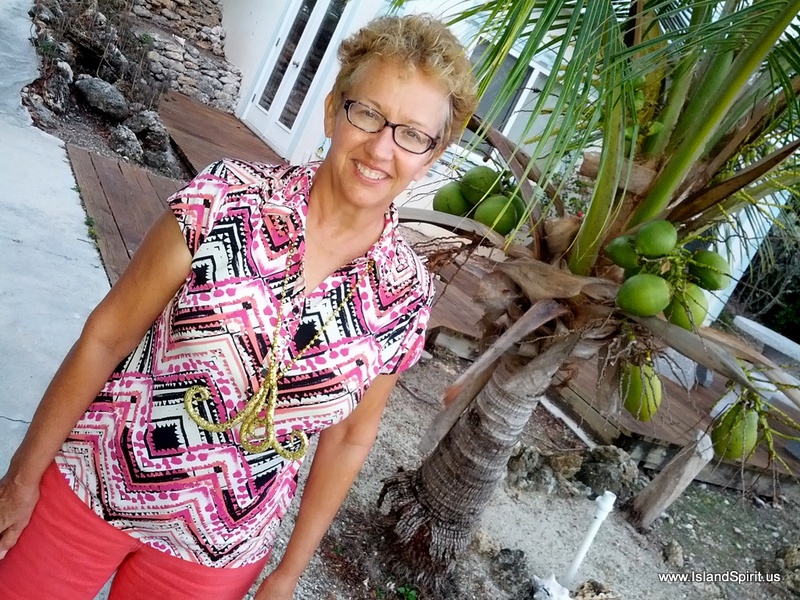 BTCBahamas.com has built a great network and here off isolated Crab Cay, we are connected. BTC has cell towers that seem to have a very long reach. Next year, we will only use BTC and not use Bahama WiMax or OII WiFi because this works so well.